This 18-minute documentary explains how landforms in the Ozarks developed over the eons, resulting in numerous rivers, caves, and springs. The video also demonstrates how Ozark groundwater is vulnerable to nonpoint source pollution. Viewers can enjoy dramatic footage of some of south central Missouri’s best-known natural features, including Grand Gulf, Big Spring, Greer Spring, Mammoth Spring, and the Jacks Fork River, plus footage of caves, rare cave creatures, bluffs, and sinkholes. The fact-filled video is ideal for middle school and high school science classes. For showing to grades 4-6, occasionally pausing video for review and discussion is recommended. Curriculum written to supplement the video is suitable for grades 7-12, with several lessons that can easily be adapted for grades 4-6. Lessons are hands-on, interactive, and meet numerous learning styles. Curriculum correlates with Missouri’s science grade level expectations (GLEs), covering geosphere, inquiry, and science impacts. The curriculum contains six lessons plus a simple pre/post test. They cover: geological history of Missouri; identifying four common Ozark rocks (lab activity); researching threatened Ozark cave species; nonpoint source water pollution; taking a “wonder water walk” after a rain; and taking a home inventory to identify best and poor and practices for protecting groundwater. This photo and above photo by Vernon Gross. 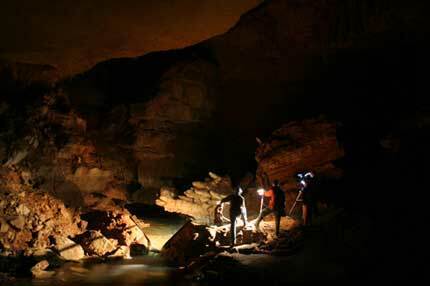 Above: Production crew shooting video inside Tumbling Creek Cave, Protem, Mo. Link to Photo Gallery: Video crew on location at Grand Gulf, Mammoth Spring, and Tumbling Creek Cave. Denise Henderson Vaughn, Mountain View, Mo. Mary Ann Mutrux, Willow Springs, Mo. Somewhereinthewoods Productions, Mountain View, Mo. Ozarks Resource Center, West Plains, Mo. Link to More Credits: Complete credits as seen at video’s end. Includes published reference materials. 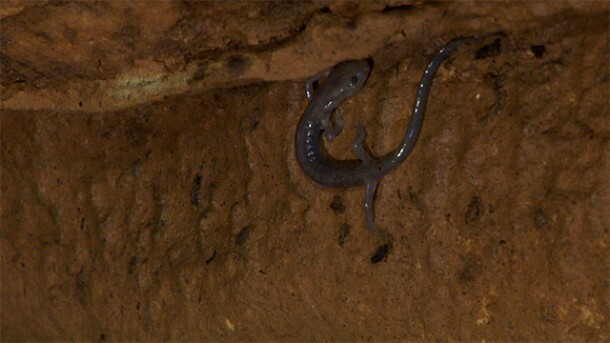 The “Karst in the Ozarks” video may be viewed and downloaded free from this website. Curriculum materials may be printed and copied for classroom or other educational purposes. Both video and curriculum are copyrighted; they may not be otherwise reproduced, altered, or any part of them used in another production or put to any commercial use without written consent. Use for home viewing with DSL connection. Captioned for the hearing impaired. Use for home viewing with DSL connection. Use for home viewing with very slow connection. Low resolution, small files, loads in two parts. Captioned for the hearing impaired. Use for home viewing with slow connection. Captioned for the hearing impaired. Use for institutional viewing. Very large file, high resolution, suitable for projection for groups. Requires very fast connection to download. Stand-alone 2-minute video of song written and performed by Tom Aley, with lyrics as subtitles. Song is also used with the credits in documentary. To play the videos above you will need the free QuickTime player. Link to latest version here.